2017 has been a stellar year for Stallion 51 Corporation filled full of adventure, awards and anniversaries. To cap off this amazing year, Stallion 51’s founder and chief pilot, Lee Lauderback is the recipient of the 2017 International Council of Air Shows (ICAS) Sword of Excellence. “The Sword” is considered to be the single highest honor an individual air show professional can receive. You can watch Lee’s acceptance speech by clicking here. The award was created in 1981 to recognize the highest levels of achievement in the air show business. Since then, the stature and visibility of the ICAS Sword of Excellence have increased as the list of past recipients has grown. The single common characteristic of these air show performers, event organizers, military representatives, government officials and air show industry activists is their selfless commitment to improving and contributing not just to their own air show businesses, but to the entire air show industry. For almost four decades, Sword recipients have been honored for their leadership, service, innovation, vision, commitment and selfless contributions to the air show business. The ICAS Sword of Excellence Award is given in honor of outstanding overall service or personal contributions to the air show industry. 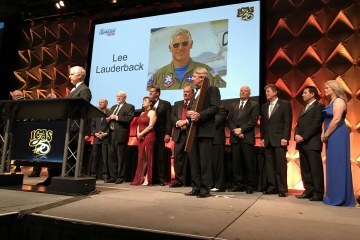 Lee’s 30 years of sharing the Mustang’s legendary performance and history to hundreds of thousands of people at airshows all over the world as well as his commitment to aviation safety were recognized and honored by ICAS’ Sword of Excellence award. The ICAS honor completes a year of honors that started with Lee Lauderback, becoming a member of the prestigious Society of Experimental Test Pilots (SETP); an exclusive group of exceptional pilots such as R.A. “Bob” Hoover and Hoot Gibson, who nominated Lee to the organization. April of 2017 marked Stallion 51’s thirtieth Anniversary; commemorated by inviting the almost 200 Mustang Check-out graduates to a homecoming before and during the annual Sun ’n Fun airshow in Lakeland, Florida. Many of the graduates’ brought their Mustangs to central Florida to help celebrate Stallion’s three decades of aviation excellence. During the summer, Lee completed an epic North Atlantic crossing in a rare WWII P-51 Mustang, following the historic route that the WWII fighters flew to fight in Europe. The 5,470 mile aviation adventure started in Texas and flew over the North Atlantic ocean landing in Greenland, Iceland and Scotland before its final destination in Duxford, England. Eight legs in seven days, arriving in time for the rare B-Model Mustang, “Berlin Express” to fly in the Flying Legends Airshow. This historic WWII Atlantic crossing flight path was followed by millions of enthusiasts via social media. Stallion 51 has had a memorable year with the best yet to come in 2018!